One of the clichés of childhood is the monster under the bed. Most kids have night terrors at some point. Many parents have to check the closet and under the bed every night to assure children there are no monsters lurking there. Although I never had to check the closets for monsters (my closet was such a mess that no monsters would fit in it), I had night terrors of my own. They came from horror movies. My parents would go on a date every Saturday night, and we had the same babysitter every Saturday night until we moved away when I was eleven. During all those years, Mrs. Harvey would put Sandee and Susie to bed, and she and I would watch horror movies on television together until I fell asleep. I pretended that the horror movies didn't scare me, but I wasn't fooling anybody. For years I had recurring nightmares of owls hanging their eyes on trees. Whenever anyone stood under the trees, ghouls would gobble them up. Invariably the dreams would end with the realization that it was time for me to stand under one of those trees. Eventually the nightmares stopped. We moved from New Orleans to a little town called Mandeville. We left the monsters of New Orleans -- the ubiquitous Mafia presence, the toxic canal, and the poor schools -- in exchange for a different set of monsters. In Mandeville I should have been scared of monsters, but I wasn't. My sisters and I used to go to the turtle bridge and watch huge alligators lazing in the swamp. When I used to explore by myself I would go wading in the swamp. It didn't occur to me until decades later that the swamp where I used to wade was the same body of water that was spanned by the turtle bridge, and that the places where I waded were populated by the same alligators that we used to watch when we went to the bridge. I doubtless had a whole army of guardian angels when I was a child. They had to work overtime keeping me alive, because I didn't have the brain of a gnat. Snakes were common visitors to our home. We had to look inside the washer and the dryer before we stuck our hands in, because rattlesnakes and copperheads liked to lurk in them or underneath them. They were attracted by the warmth. The Girl Scout camp that was near our home had two lifeguards -- one to make sure nobody was drowning, and the other to look for water moccasins. More than once I lifted my head from the water when I was doing laps in the lake to see a water moccasin keeping pace with me. My most memorable encounter with a monster happened during the summer of my thirteenth year. One night I was innocently asleep when a monster tried to crawl in through the open bedroom window. There was a screen on the window, and the creature made a lot of noise as it pulled on the mesh. I ran into my parents' bedroom, yelling about the monster. My parents no doubt thought I was crazy. Either they convinced me that I had been awakened by a "big dog," or I told myself that. Eventually I was able to go back to sleep. The following morning my parents were surprised to find the screen from my window lying on the ground outside. Sweet vindication! 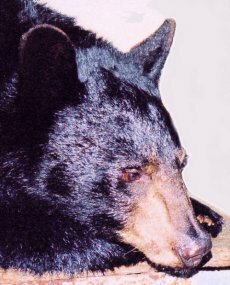 When he went out to buy the morning paper, my father heard that someone had shot a black bear fairly near our house during the night. I never saw a picture of that bear, but thanks to the miracle of Facebook my sister Sandee discovered it and sent it to me. Here it is. The "big dog" that ripped the screen from my open bedroom window. Now I am an old person. The monsters today don't hang their eyes on trees, they don't lurk in the swamps and in the lakes and in our washing machine, and they don't pull down my window screens. My monsters take the form of unpaid bills, of mistakes I have made, of feelings I have hurt, and of opportunities I have missed. I try to ignore the monsters. I try to learn lessons from the monsters that have lessons to teach, and I try not to feed the remaining monsters with my fears. Most of the time I am successful.